What happens if you are not attuned to the changes of energy? Are you planning your days as if you were a robot i.e. doing what you think you should be doing, rather than what feels right for you? 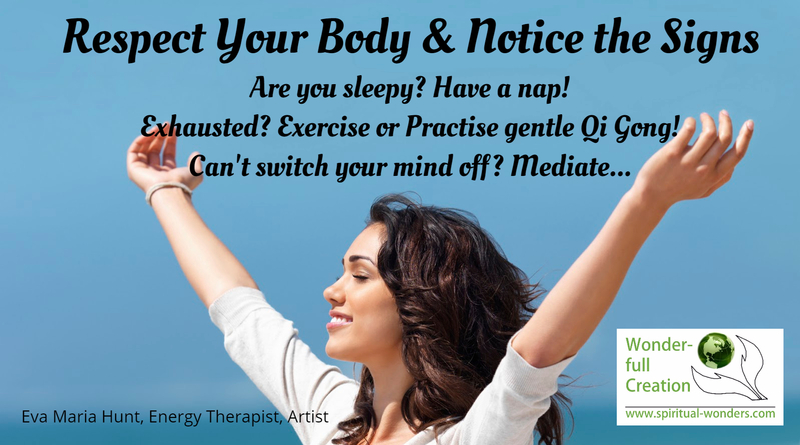 Ignoring your body’s natural rhythm? Everyone of us have different energy set up, some needs more sleep than others, some are more sensitive to irregularities in their daily schedule. However if you are not in tune with your body or chose to ignore the signals that your body sends you warning you to slow down that causes problems. For example if you work long hours on a regular bases (Yang), cutting into your resting period (Yin), your energy will become unbalanced, you start feeling tired, then exhausted, and if you do not listen to your body’s needs sooner or later you may fall ill. This is your body’s way of forcing you to listen to it. And if you don’t it will stop you anyway. Please do not let it go that far. Do not wear yourself out. Some people are naturals in sensing the energy changes during their day, so they intuitively know when to increase their workload and when to slow down. Others need to learn to converse with their body. Just be mindful of how you feel and act accordingly, if possible. When you work towards tight deadlines temporarily you might need to make sacrifices with your time and physical well being. It’s ok as long as you balance it out with plenty of relaxing activity and a little self-pampering afterwards. In general try to work out a more mindful way of living, so your body can recharge instead of running on empty all the time. The material world is all about duality, which is perfectly described by the Yin and Yang, darkness and light, female and male, Moon and Sun… These seemingly opposite forces are in constant transition, when the day turns into the night, seasons changing, and even during one day the energies moving from one to another. 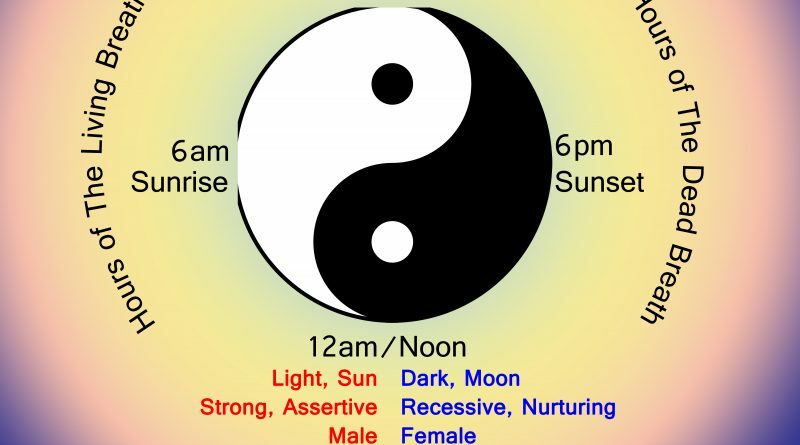 In the 24 hour Yin Yang Cycle we find 4 Sacred Times of The Day. Midnight starts off the Yang cycle, “The Hours of The living Breath”, the sunrise follows and at Noon it turns into the Yin part of the cycle, “The Hours of The Dead Breath”, reaching the sunset and finishing the cycle at midnight. These sacred times are the times of transition between the opposite forces, as they raise and fall during the day. If you are aligned with nature’s energies you are able to raise with the sun between 5am and 7am. Meditation, followed by gentle exercise, gradually increased to proper movement is a perfect start for the day. As you are already half way through the Yang part of the cycle, the spring part of your day, this is the time to plant seeds, plan your day, your projects, clear your mind, get in touch with your intuition, spirit guides, angels depending on your perception of the world. Then your day starts and you become more active. The lunch break is important not only to take nourishing food in your body, but also to slow down a bit and rest with a walk, spending some time outdoors to help you adjust to the changes in energy. In the evening you gradually slow down and ideally finish your day with a quiet time, having a bath, reading, meditating to prepare for a good night sleep. 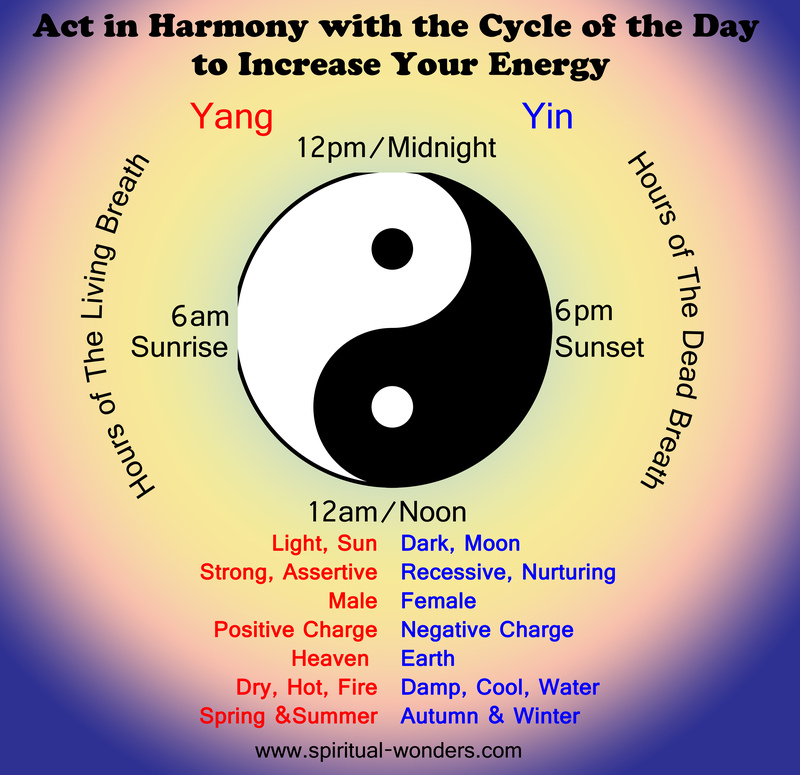 As the yin and yang transitioning during the day, there is a larger cycle during the year. It’s possible to sense the transition between seasons. Although the summer months are June, July and August I usually feel the energy shifting at the beginning of May from spring to summer and early August from Summer to winter. And these shifts are changing our behaviour, our eating habits, how active we can become, when we get up and go to bed. In the 21st century in the western world many people lost their connection with nature and with their body and they became completely unbalanced energetically, which leads to anxiety, anger issues and even physical problems. If you wish to tune into your own energies and nature’s, you need to slow down and notice how you feel. Go outdoors, have a walk, start a meditation, yoga or Qi gong practise. Spring (Yang) – seeds are growing, everything comes to life. It’s the time of New Beginnings. The days get longer – Get up early & stay up until late. Summer (Yang) – everything is still developing, blossoming. – Get up early & stay up late. Autumn (Yin) – Harvest time. The days are shorter. – Get up early & go to bed early. Winter (Yin) – Hibernation time. The days are even shorter. – Get up later & go to bed early. At the end of the day it all comes down to being aware of your own energy set up. Knowing your limits physically, mentally and emotionally. If you are in touch with your intuition that gives you an advantage in this area. However if you are not, you can start taking baby steps to improve how you feel. Try being mindful i.e. being aware of your thoughts and emotions, and live in the present moment. How to start? That will be the subject of my next article. Until then pay a little more attention to your body and try to build a connection between your mind and your body’s signals and notice how you feel. Enjoy the experiment.